What Does VHP Mean to You? I think VHP is a bridge between ideal/perfect society and action/practice. There were times I thought about digging a well, building a library and opening a clinic in less developed country. The thoughts ended in my mind without making any actual efforts. VHP shows me the organized way to achieve such goals, and I can’t wait to really contribute! Personally, it’s more like a group filled with people with kind minds and great ideas. Though we are doing serious and difficult tasks, the happiness spending time with VHP’ers always make the process more fun. I just joined VHP this year, but so far I’ve come to love the sense of community and purpose in this org. I think VHP is a great way to give back to the international community, which is something I feel very strongly about as an international student. Additionally, while there are many community service projects on campus, I find that the work I do at VHP does make an impact; occasionally in other orgs I feel removed from the people I am helping, but VHP offers volunteers the chance to really see the fruits of their labor with the March trip. VHP gives me insight on a world that is totally different from the world that I am accustomed to seeing and living in. Although I just joined VHP this year, I can tell that the sense of community is really strong, and every member is extremely dedicated to the project. This was my second ever September Sale. 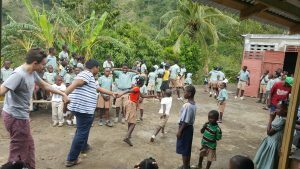 As the main fundraiser for our primary school, It was especially near and dear to my heart. I felt that this September sale was much more coherent, and less stressful than my involvement last year. I put in 3x the hours, but it ended up being more of a stress relief rather than addition. I found myself coming to this sale, head swimming with assignments and “to-dos,” only to be welcomed by my VHP family and have those worries drift away, in favor of coming together for Haiti. This year was especially hard because Haiti was drastically hit by Hurricane Irma- especially the rural mountain village we work with. Chermaitre had a significant loss of life, farmland, and buildings. It was incredible to see all of our new and old students, community members, teachers, alumni, and all other project supporters come together for this sale to celebrate the people of Haiti, while forming solidarity in the wake of Hurricane Irma’s loss. 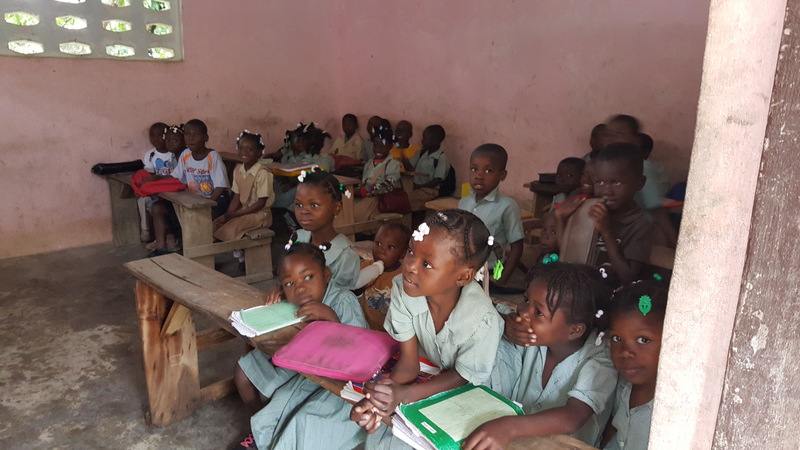 This year was a great success and provided many opportunities, once again, to spread VHP’s mission of reframing Haiti in a lens of beauty and grace, rather than poverty and destruction. VHP strives to have the beautiful, kind, and dedicated nature of the Haitian people outshine the widespread negative view presented of Haiti through the popular media. This goal of education, as well as fundraising, is truly what September Sale accomplished this year- and I’m sure it will for years to come. Grace Roebuck ’20, is the Education Director for the 2017-2018 year. The meeting with the women’s co-op was invigorating. We opened the meeting with the women singing to us and bringing us into their community. As we delved into the meeting, it was clear this was not a soft-spoken group of people. There was an exuberant atmosphere as the women shared their thoughts on all of the positives and negatives about the work they were doing. Udbhav and I worked with Pere Wildaine to narrow in on exactly what we could do to improve their working experience and how they could expand their market and the products they sold. We discussed several possibilities about general adjustments to their daily experience, such as establishing a literacy class for the women and introducing baking as a skill the women could learn, with the hope of eventually opening a local bakery. 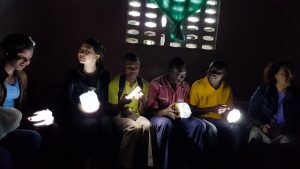 To conclude the meeting we distributed Lucy Lights to each of the women to use in their homes and took pictures. I left the meeting feeling incredibly inspired by the women and all they have been able to accomplish and appreciative that I got a chance to spend even a small amount of time with them. Haiti was an incredible experience in terms of personal growth, relationships, and information gathering for all initiatives, especially education. We started by visiting the Secondary School and having a meeting with our 22 scholarship recipients. Facing the six girls and sixteen boys, it was a little awkward at first, but after our ice breakers, the meeting gave way to an open and honest conversation. From this meeting, the consensus was there needs to be many changes for the future including an increase of supplies, many more text books and reading books, improved living conditions, and more frequent servings of breakfast and lunch. Concluding our second Secondary School visit, we dispersed one Luci light to each student. These solar powered, inflatable lights will enable students to study and do work even after the sun sets, improving their living conditions and education. The other school we met with is the Primary School in Chermaitre, where we met with a group of students and a group of teachers separately. The teachers were very thankful for all the work VHP has done in building the new school and ensuring regular pay cycles. They believe there needs to be more food in the lunch program and the breakfast program must be reimplemented. The teachers also expressed interest in developing an Adult Education plan and curriculum. Information gathered also revealed there is no curriculum on human trafficking, despite Haiti being the 7th most trafficked country in the world. The meeting with the primary school students also went well; they agreed more food is needed at school. In addition, they need text books and reading books and would enjoy musical instruments—we postulate recorders for the students could be a good start. Overall the students were very receptive and thankful VHP and their honor and persistence through school makes every second spent on VHP 10x more worthwhile. While our meetings and interactions were constructive in helping us glean important information about the schools, the commitment of all of the teachers and students was evident and compelling. At the meeting with the primary school teachers, all of the instructors expressed their appreciation for our efforts to improve their jobs and help them better facilitate their roles, roles which they know are critical for their young students’ growth and achievement. And the teachers’ quick and unanimous support for kickstarting adult education classes stands as a testament to their yearning to spread education to the wider community. Giving them the Luci lights for their classrooms as well literally and figuratively brightened up themselves and their excitement for teaching, which was pleasing and reassuring for us to see. Along with the teachers’ enthusiasm, the patent motivation and fortitude of all of the students was striking and inspiring. A trend emerged among the mindsets of the primary and secondary school students: that their drive for educating themselves stems from a deep desire to exploit their potentials and passions by becoming contributing figures in society. This desire has catalyzed in them an admirable perseverance: despite scarce meals, insufficient textbooks and supplies, and two-hour hikes to get to school, these students remain dogged in pursuit of their educational goals. As a group of young, dedicated students ourselves, the connections that we sensed with the students, who bear such different origins from us, exemplified and reaffirmed the universal power and importance of education. Being on the Reforestation Team for the March 2017 Haiti Trip allowed us connect with people and visualize our impact and through that, understand the project. Our first activity during the trip was a visit to Fondasyon Konesans Ak Libète–the Foundation for Knowledge and Liberty (FOKAL), an organization based in Haiti that engages with other international organizations and communities to improve the life of Haitian people. We met with one of the directors at FOKAL and discussed how VHP operates in the States and how we collaborate with the people of Chermaitre. We also spoke about how the grant will be directed towards our Reforestation Project and we also learnt about FOKAL and their mission. 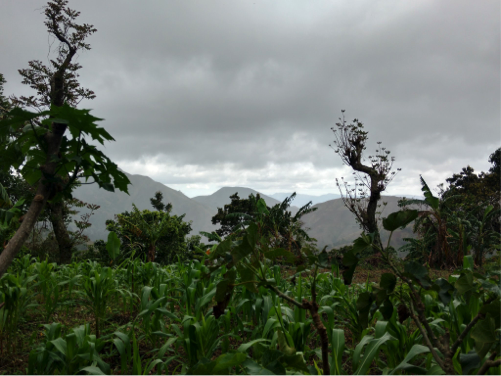 We travelled to Chermaitre on our third day in Haiti and on the way there, we were treated to a beautiful landscape and view of the mountainous region despite the rigors of the hike up the mountains to the Primary School in Chermaitre. We had a meeting with the reforestation team the day after our hike and it was an informative meeting as we got to learn that over twelve thousand of fourteen thousand trees had survived after the storms experienced during the Hurricane Matthew period. This was a positive sign after we saw some areas where erosion had occurred. We also discussed the ways the grant would improve reforestation in the village and inform the villagers, farmers and children about the necessity of reforestation in a region like Chermaitre. The team is doing a good job and helping to shape the positive partnership which VHP has with Chermaitre. We went on a hike they day after and we surveyed various farm plots and some of the villagers who owned them. From our sights and interactions, we could see the hard work the people of Chermaitre put into the reforestation project by the amount of little trees that were growing and we could also feel the sense of joy from financial security the farmers and their families enjoyed. 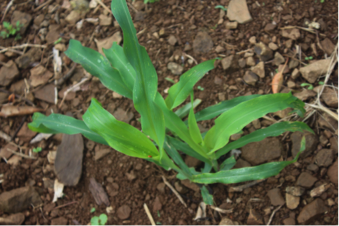 We also got ideas of what new crops these farmers could grow to improve their earnings at the market. Something else that was a new experience was testing the soils at various plots that held coffee, chadeque, cocoa, and a host of other crops. 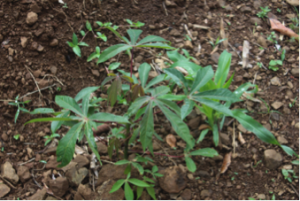 The people of Chermaitre work hard and we are glad that they are yielding the fruit of their labor in the variety of crops and trees that are present. After meeting with the team, seeing farmers labor on their plots and just hearing positive experiences, we are thrilled that the partnership with Chermaitre is thriving and we know why. 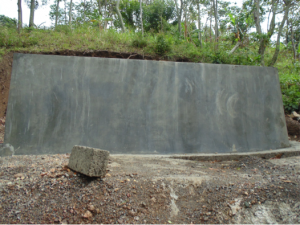 For us now, the next step is to continue to direct our efforts on building on what is on ground at Chermaitre, thinking of how the grants will be utilised and thinking of how to work with committed people to make an impact. As individuals, we appreciate the opportunity to learn and understand what we are part of and to meet with the strong and diligent people who we hold hands with the make the Vassar Haiti Project possible. It’s simple. When you and I are thirsty, we get up and have a drink of water. But what if you can’t? 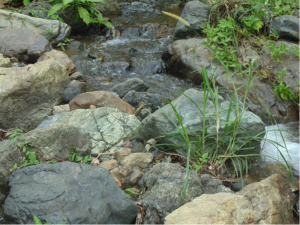 What if clean water is nearly impossible to come by? What then? Would you risk cholera to stay hydrated? This is the reality of life for many people in Haiti and especially the people of Chermaitre. As a representative of the Water Initiative, I was fortunate enough to learn about the efforts currently underway to provide the people of Chermaitre with increased access to clean water. 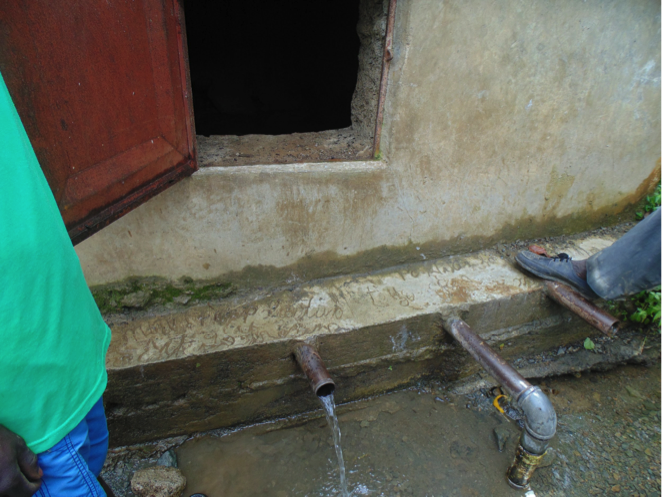 Water is life and yet, so many people in Chermaitre are unable to have clean water. The water that they do have access to, puts them at risk for developing diseases. It is so critical for them to have clean water. Lives literally depend on it. 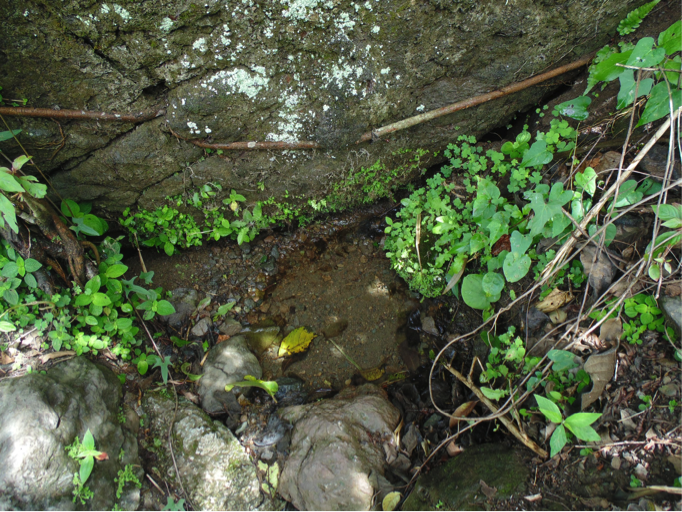 Ultimately, the irony is that Chermaitre is surrounded by the most beautiful mountain springs that form a river, but the water is not safe to drink. One of the most sobering experiences I had while in Haiti was after the climb up to Chermaitre. The two little boys that had guided me up the mountain signed to me that they were thirsty. I gave them water but I knew this would do little to ameliorate their situation. The purification system for the water is coming together very quickly and the people of Chermaitre could not be happier. I’m sure I speak for all of VHP when I say that we are just as excited. I think one of the most valuable things that I got from representing the Water Initiative was the chance to learn about the work that initiative is doing and the knowledge that in some small way, I contributed. I was able to see the entire framework of the future water purification system, from the mountain spring source, to the cisterns, all the way to the faucet at the school. I am excited for what the future holds. I am excited not only for VHP, but for the people of Chermaitre finally being able to drink water without fear. Alan: I must confess that the climb to Chermaître has been the boogeyman of this entire trip. Since coming to Haiti I have wondered if I will be strong enough to make the climb but all those fears were dispelled by two little Haitian boys named Schneider and Livingston. They were my guides up the mountain, these two little boys, who I outranked in age, in size, in strength, in privilege, were helping me—a complete stranger (sweatin’ like a barn animal / gasping for breath)—up a mountain they so easily climb every week. The boys held my hands and clenched every time I slipped, they made the climb a breeze, so much so, that I arrived first! The people of Chermaître, while they may not have much, have proved themselves to be of the highest orders of humanity. They are kind when they have no reason to be, they are generous when they have every reason to be selfish, and they are effervescently joyful even when it rains for days at a time. As my time here comes to end, I will never forget those little hands that held my own up that rugged mountain. I hope through my continued work with VHP, I can someday, somehow, return the favor. Sophia: I thought I had conquered the mountain, but it got the best of me. After a wonderful day and debrief on Wednesday night, I got sick shortly after dinner. I spent Thursday being nursed by Lila, Andrew, Jackie, and all of the other trippers. On Friday morning, Dr. Gueslin joined us here and took care of me throughout the day and through last night. Lila brought me many “get well soon” letters from my fellow trippers, from our incredible drivers, from Père Wildaine, each of which made me feel infinitely better. Later in the day, she brought me a letter from the children of the village. This brought me to tears; they barely knew me, and yet they gave their hearts wholly to a stranger, asking about me and hoping that I would be outside to play with them soon. At this point, all I have really seen of Chermaitre is my tent and the bathroom, but what I have heard through the walls and from those who have visited me tells the story of a people who exist in the most generous, open way possible. Today, Saturday, I feel endlessly better and cannot wait to witness and be a part of Chermaitre for myself. Gabi: Throughout my time in Chermaitre, I have discovered the generosity of the Haitian people. They continuously proved to me that, as Manning shared in one of our debriefings, people here don’t expect anything from you. They are not expecting any form of payment for their actions. They are generous because they want to be. When all of the children of the village and some of the adults, kindly and bravely lugged our large hiking backpacks and suitcases filled with equipment up the mountain for us, without us even asking for the help, they did so because wanted to help make our climb easier. There is an incredible sense of community and love among the people of this village. When we arrived in the village, we were openly received by members of our women’s co-op, smiling at us, giving us hugs and kisses. A couple of days later, we gave out Luci lights to the members of the women’s co-op, something that they hadn’t expected to receive at the end of our meeting with them. However, not every member of the co-op was present in the meeting and, as I was handing out the lights, I was continuously reminded that there were other members who were missing. Receiving those comments made me really happy, because I realized that these women have formed strong bonds with each other. They want to make sure that all of their companions get treated the same way they do. It was truly a beautiful sight. The women were also all genuinely happy and excited to have received the Luci lights because they could now have light at night. Until I had arrived in Haiti, I had not really thought about the fact that many people live without electricity or access to electricity, and suddenly I found myself in a meeting where women were receiving their own personal form of electricity, and expressing interest in receiving solar powered stoves and ovens in order to eventually learn how to make pastries. Then, when we were painting the preschool classrooms with primer, we suddenly found ourselves surrounded by children holding our spare paint brushes and rollers, haphazardly applying paint to the walls. I believe that watching us physically improving their school got them excited, and made them want to help. This also made me very happy because I hope that having participated in bettering their school has made them more excited and proud about their presence in the school buildings. Overall, being in Chermaitre has been an eye-opening experience. In the United States, most interactions function on a system of reciprocity, where the reward is usually a monetary payment. That doesn’t exist here, in a remote village where people have so little to give. Here, people are selfless, they are generous for the sake of being generous, because they feel the desire to help. Additionally, we often take things like electricity and even painted rooms for granted, but things that seem rather insignificant to us can mean the world to someone in Chermaitre. Having a Luci light can enable someone to have more autonomy by allowing students to be able to do their homework when the sun goes down, and parents to be able to comfortably engage in activities around the house. Adding a coat of paint can make a classroom feel like a home. Sam: I certainly sometimes feel a discrepancy between those who surround me and myself at Vassar, while I also have felt it in high school and my experiences. I’m a diligent student who has the tendency to focus solely on my studies and academics, while others around me pursue sports, activities, and passions in addition to school. This difference has yielded me a sense that I’m more of an observer and a receiver, and less of an individual who can effect real change or influence in a situation. But this perceived gap or separation between myself and others is starting to be filled by an increasing confidence and a decreasing self-consciousness. Traveling to Haiti has presented opportunities that have instilled in me a sense that I am not always stationary, and that I can indeed enact change. As a co-representative for the education initiative, the notion of leading the education meetings and acting as the mediator between the secondary school students, the primary school teachers, and VHP is intimidating. I was especially nervous to lead the meeting with the primary school teachers, because despite having already met with the secondary school students, asking the appropriate and necessary questions to the teachers in order to extract the information we needed was crucial. And I went into the meeting cautious but confident; from the meeting’s beginning, I felt rewarded and I was making a meaningful difference: I spoke in French, welcomed the teachers, and throughout Grace and I asked questions that were calculated and critical. At the end, seeing the confirmation of my fellow trippers’ and also of Lila and Andrew’s of a job well done was rewarding, but I also held a personal sense of accomplishment. So far in the trip, I have overcome, in separate circumstances, the stagnation that sometimes invades my thoughts and actions, by acting as a leader and a tripper, who can make a difference and contribute to the overall progress of the group; I have practiced my French and surmounted my fear in speaking with others, while maintaining the attributes with which everyone associates me. I can’t wait to see the opportunities that the rest of the trip will offer for me and my growth as a person. Sabrina: Haiti has opened my eyes to so many things I have taken for granted and has made me realize how materialistic the world I live in is. I live in a society where there are a few number of helping hands and so many hands holding me back, dragging me down. People will tear me down just to be a step up. But a step up to what? Are we searching for more money, power, friends, happiness? I do not know but I have realized here that there is no purpose besides the one we create. The way to achieve that purpose is understanding who we are and what we represent. The choice is yours to make, to decide if your own self-interests are more important than someone else’s. We can blame situations on people, bad luck or even God in some cases but it is our choices that decide how we react. My fellow trippers have made me realize this and be able to articulate this. These trippers are the most beautiful, generous, and loving people I have met. They remind me that the society we have come from does not designate who we can be. Here, in Haiti, anything is possible because all you have is positive support and unconditional love. Christine: I cannot imagine being anywhere else right now. Everyone I have met is so open, giving, and full of energy, from my fellow trippers to the people of Chermaitre. Being in such an environment, I can’t help but exude these qualities myself, things that don’t necessarily come naturally to me. My favorite parts of the trip by a longshot have been playing with the kids and getting to know them. I quickly learned I was a little too trusting when I was walking up the mountain and let one of the girls who was helping me hold my headlamp. I have yet to see it resurface. I can’t help but be trusting with these kids though as they’ve shown me so much love and support from the moment I started walking up the mountain. One girl literally, supported my legs as I started to waver on a steep incline on the way up. I thought it only fair to return this favor of support by offering piggy-back rides when we went on a hike the next day, a decision I was not physically equipped for but did anyways, albeit very out of breath. Over everything, these kids really, for me, represent the core of VHP as they are the new generation. They are growing up in the world that VHP created: their education, the buildings they hold classes in, and the food they eat when at school are all part of the vision that VHP has been able to realize in Chermaitre. They will grow up knowing that they have support from two families, one in the US and one in Chermaitre and through this we can truly be in the partnership that we often discuss. Udbhav: The days in Chermaître move slowly and surely. Every hour seems like a week, every day like a year. Time is experienced exponentially here. It makes me wonder about things back home…where properties of exponents no longer hold, and each month seems like a day, each year a week. The problems here seem more intense and basic- water cisterns do not have pure water, walking to school takes longer than being in school, governments fail the people, and the people fail to realize their best selves. Regardless, the energy of the people, their fascination with the world around them, and the relative ease with which they smile remains incomparable. Maybe, problems and happiness are unrelated after all. Sociology asks us to understand how successful can a person really be given the social life that they are born into. What can a child of Chermaître really achieve? What does a child of Chermaître want to achieve? Those two are very different questions. Sometimes I am encouraged to go back to life back home in Allahabad, India- where I would be too aloof to be adrift. Maybe people here seem happier because they realize that achieving something is not the same as being happy. Daniel: “Your thoughts are not real”, Lila Meade (Madame Andre) says frequently. I have been told about the hike up to Chermaître and about the village itself more times than I can remember, but nothing would have prepared me for Wednesday evening’s journey. It was an exciting hike featuring breathtaking views and the kids were everything I need in life right now – joy, full of laughter, and pursuing a purpose (getting up the mountain). After conquering the rough terrain with my peers and fellow trippers, we were greeted by women who expressed pure emotions and kissed us on our cheeks. After this moment and even till now, it has been a flurry of emotions and positivity. Have you ever felt pure without showering for a while? Well, that’s me right now. Pure bliss, pure joy. These are things that envelope my dirty self at the moment. With little concept of or regard to time, I find myself less burdened with limitations of time that normally surround every activity I do. I am enjoying every meeting with the various initiatives, every hike to visit households and farms, conversations with new friends in my ‘simplified’ Creole and conversational French, the blessed food that refreshes me, interactions with fellow trippers and the STRONG people of Chermaître. I have also witnessed countless moments of selflessness, care and love that have floored me. What Chermaître and its people has to offer is a view of ‘Mountains beyond Mountains’, an understanding that life as I have known it has more facets than acquisition of material and satisfaction through that or a longing for comfort and protection, a space to feel loved by people who think I am Haitian because of my looks but still smile and embrace me with pure joy after learning about where I’m from and kids to dance with and play hand drums with. As days pass by, I understand more of what VHP does and what my contribution is; this organization partners with people not thought of, people unknown or not focused on even as they keep thriving and being the strong, diligent, committed and hardworking people they are. So I am happy that I can join other VHP volunteers and other villagers and children in Chermaître to draw and paint a better future. Trust me, it looks colorful already and there’s more paint left. Like Alan would say, Bless!!! Phebe: From these couple of days in Chermaître, the generosity and love of both my fellow VHPers and the people of Chermaître have blown me away. On Wednesday evening, we reached the base of the mountain where we would start the infamous hike. The villagers and children immediately took our large hiking bags for us, while we only had to carry our small backpacks. At first, this did not feel right. I felt that we should be carrying our own things, but quickly I realized, as a little girl grabbed my hand to help guide me up the mountain, that these people wanted to do this. Throughout each day, acts of love and generosity appear everywhere from making us three meals a day to villagers allowing us to see their homes and farms to the smiles of children just as you say hello to them. Even yesterday, as I was recovering from an illness in my tent, all I could hear was laughter and joy echoing from throughout the school. Personally, as a Christian, the people of Chermaître have shown me the way God intends us to treat one another and love everyone. I see this love spreading through all of my fellow trippers, whether they are Christian or not, and know that this group will be able to spread this love back home in the states, where love and kindness are much needed at this point in time. Lila: Eleven Vassar students are now in love with Chermaitre, its people, children, landscape and raw beauty. Almost 20 of us nestled into our mosquito tents each night, sleeping on the concrete floors of the school rooms, under the most adverse of conditions, including way too much rain, visits of bacteria into our internal systems and too many ‘house visits’ (or should I say ‘tent visits’) from our indefatigable Dr. Gueslin Joassainvil in the middle of the night who rescued us from our own bodies. But none of this deterred us from falling in love with our friends in Chermaitre, who ran to us as we entered the village, embracing us like family. The children stole our hearts as we sang, jumped rope, played soccer and laughed together. Meeting after meeting, the new trippers learned of our relationship with the people of this village and surrendered to being in love: seeing the dignity of the reforestation director, realizing the passion of the Women’s Cooperative members, watching the hero of our work Père André Wildaine in true form and watching the clinic serve scores of people each day defied any and all of the challenges we faced coming in. Our work is so important and coming here with each visit manifests itself unrelentingly. This group of Vassar students is officially ready to take on anything! Up the mountain we go! The time has finally come! Our group of March trippers is ready to hike up the mountain to Chermaitre. Here are their thoughts as they prepare for another five days of adventure in the rural village. Andrew: The group is doing so well, being super supportive of one another and soaking in experience after experience. Now comes the glorious ascent to Chermaitre! Sam: I’m already sweating from places I didn’t think could sweat, but at least I don’t have to worry since it’s inevitable. Grace: Last night I had the best rice… the only problem is I put sugar instead of salt. Sophia: This is the day we have all been waiting for! Today we hike the mountain to Chermaitre. It’s time to sweat, chat, laugh, and to get through it all together. Lila: What a privilege it is to be with such an amazing group of students! I am so lucky! Each moment I am always blown away by their passion, energy and commitment to put positive change in our world. Haiti is a great teacher. Alan: Standing at the base of the mountain, I hope to channel the strength of the Haitian people. Phebe: The first few days have been incredible. The whole group is full of love and laughter making every moment entertaining and enjoyable. Today we are heading to Chermaitre and it feels surreal that this moment is so close. The Vassar Haiti Project is coming to life each day and I can’t wait to see Chermaitre in order to complete the vision. 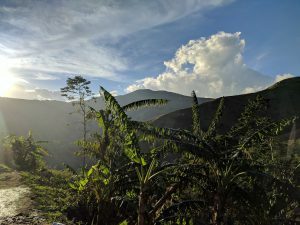 Gabi: Days after arriving in Haiti, we have experienced enough sights and sounds for it to feel like we’ve been here for a week instead of three days. It has been overwhelming at times, particularly in the chaotic intensity of street art markets, where all of the artists, vendors and colorful paintings were competing for our attention. Nonetheless, I’ve been having a wonderful time over the past couple of days. It has been educational and inspiring to hold conversations with members of women’s co-ops, and an incredible amount of fun teaching a group of village children how to dance to silly children’s songs. 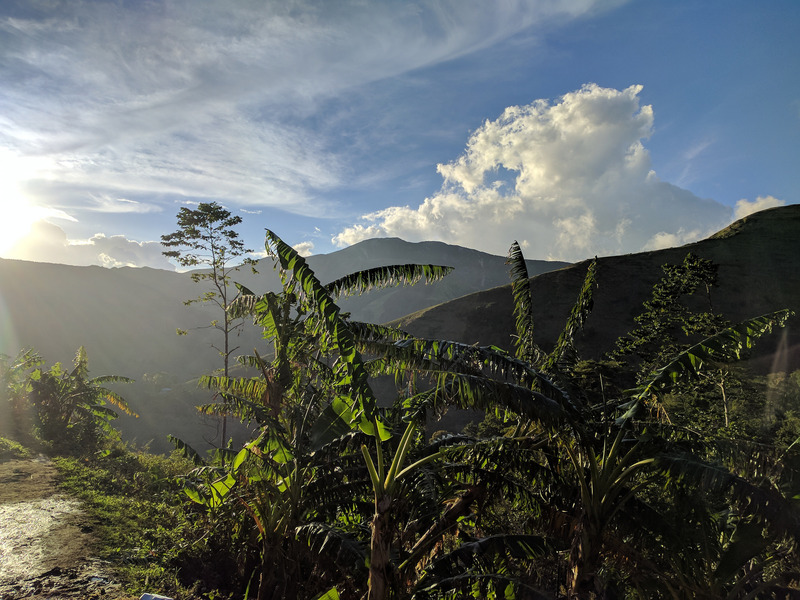 I have loved learning more about the Haitian people, becoming more comfortable with holding a conversation with them in Creole, absorbing the sights of the city, and now, the green landscapes and mountains of rural Haiti. Manning: It has been only three days but it feels like way more than that. I have been chatting a lot with Lila, Andrew, Jaqueline and our Haitian friends about what the meaning of life is. After all the earth could disappear tomorrow, it would not change the universe in the slightest way. Indeed, life has no meaning, UNTIL you put meaning to it. It could be friends, parents, children, a railroad you build, a company you found… It all depends on you – happiness is a choice. For now, to me, it is about making an impact on those around you. When I hugged every child during this journey, I am only expanding the circle around me to spread my warm disposition to. Altruism is difficult and people always (unfortunately) look for ways to gain something out of it. Perhaps if we find happiness in what we do, that is the best form of altruism in the world. That is what makes VHP wonderful – when happiness is shared, it is doubled. Sabrina: Being in Haiti has opened my eyes to the untapped beauty of the world. These three days have shown me that happiness is its own entity; it is not linked to money or objects. Happiness is the joy that people you love give you, the laughter that fills the streets, the smiles and bonjours spoken to strangers. People in Haiti may not have much but that does not limit their love and appreciation for life. I am breathless from the welcomes I have received here. Yesterday, we met six kids and I think I speak for all of the trippers when I say we fell in love. I am horrible at speaking Kreyol and French but that did not matter because gestures, facial expressions and emotions are universal. Smiles shared went from nervous to joyous in a matter of minutes. Love and happiness have become shaded from other unimportant things in life. Haiti is allowing me to see this and appreciate everything I have and accept what I don’t have. Daniel: It’s been two full days of adventure and I love all of it. We were on the road for most of the day and it was an opportunity to bond with fellow trippers and the adults in the car. It was also an opportunity to observe the cities and the landscapes and one thing is constant – Haiti never stops moving; from the number of people on the streets all day to the loud noise of the trucks late at night, there is an energy that every outsider has to tap into. We visited a primary school and a women’s co-op, Peacequilts, yesterday and we heard about the ways the co-op was run and we also interacted with the kids (shout-out to Estelle). The kids danced gracefully, laughed in ways that evoked pure joy and just reminded me of ambition, of dreams, of love for learning and of having an open heart for people. We continued our road trip, the landscape was as beautiful as ever. At VHP’s art sales, I had wondered why there were a lot of landscape paintings, but in a country like this, why won’t one want to recreate the beautiful sunset and lush, green landscape on an easel? We got ice-cream after and then continued our journey, this time along a ‘bibi di bop di bop’/very bumpy road. After arriving at the hotel and getting rest, we are all prepared for our hike up the mountain to Chermaitre. I hope my two workout sessions before the trip really pay off today. I love every single, little, teeny, tiny, inch-size, minute bit of this trip. So, BLESS! Udbhav: These three days in Haiti have been transformative. There are moments of reflection, of guilt, of apathy, of empathy- and above all- of questioning each and every fabric of my being. The lies that I have told myself about what matters and what doesn’t. The truths that I have sieved along the way. Everything has been stirred up into a state of flux. It’s a re-invigorating feeling -to convince myself of my purpose- and for that I am forever grateful. Christine: Being in Haiti is non-stop movement and energy. Every day is four days packed into one as we travel across the bumpy roads, flying up and down in the seats of our cars. It’s curious though that even though we’re all exhausted and drained, the smiles can’t leave our faces. We’ve bonded so much as a team through all the crazy adventures and experiences we’ve encountered, which, in turn, just makes us so much stronger and enthusiastic as a group, ready to take on each new challenge. More than anything though, I appreciate how open and inviting everyone­ is to each new experience and person we meet on our journey. I’m so grateful to be a part of the community we’ve built.